Description: French chart of Newfoundland. Other than the few small settlements in the southeast corner of the island, the rest of the interior is still unsettled and almost entirely unknown. Coloured. 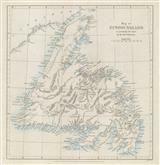 Description: Interesting map of Newfoundland with the comment "The Inland parts of this island are entirely unknown", a reference emphasizing its importance as a fishing port. Coloured. Description: Bay of St.Anne and Port Dauphin. Decorative cartouche and original hand colour. Title: : Johnson's New Brunswick, Nova Scotia, Newfoundland, and Prince Edward 1d. Description: New Brunswick, Nova Scotia and Newfoundland. Coloured. 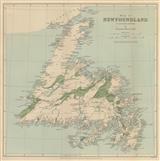 Description: Newfoundland, a survey to accompany the paper of Reverend J. Moreton. Printed colour. Title: : Newfoundland. Geological Map of the Island. Description: Miniature map of Newfoundland with view of three men cleaning fish on the banks of the island. Printed colour. 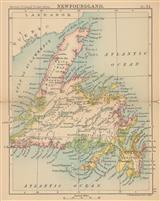 Description: Map of Newfoundland to accompany the Paper by Alexander Murray. Original printed colour. Description: Newfoundland. Miniature map. Original printed colour.